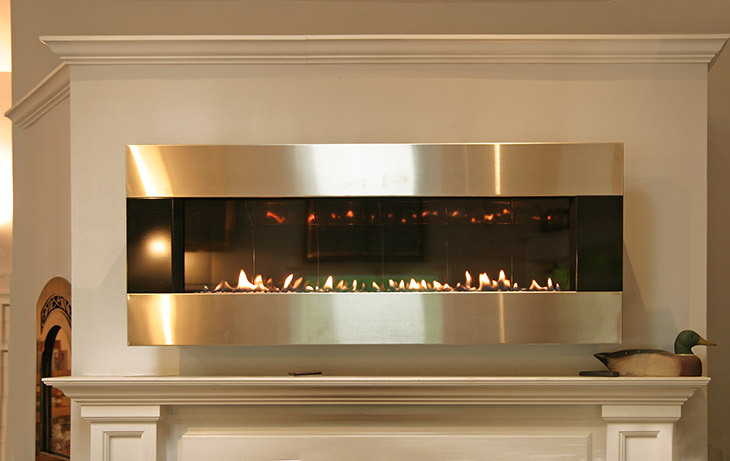 We offer a range of beautiful linear gas fireplaces to customers coming from Easton, Norwalk, Ridgefield, Wilton, Weston, Newtown, Brookfield, Darien, Lewsiboro NY, and a number of other communities through Fairfield, Westchester, and Litchfield County. A fireplace is a great way to enjoy the warmth and atmosphere of a burning fire, but a traditional masonry fireplace can be big and bulky, and not very attractive in a modern home. Linear gas fireplaces, on the other hand, are a great choice for homeowners that prefer sleek lines for a clean look & modern appearance. A linear fireplace is a fireplace that is designed with a long and low rectangular viewing space that features a wide swath of flames, making it a perfect addition to a contemporary space. The clean construction and modern design allow linear gas fireplaces to be installed in many locations around the home, often in places where a masonry fireplace would be impractical. Plus, these models offer a number of features and options that homeowners can choose in order to further customize the look and feel of their new linear gas fireplace. With options like fireglass and decorative stone, homeowners are able to perfectly complement their current home décor. While some models are vent-free, most linear gas units have flexible direct venting requirements that allow more freedom with installation. Whether you are planning on upgrading your current fireplace or performing a brand new installation, the minimal installation requirements of a linear gas fireplace make them the perfect option. Thanks to their linear design, these units can even be added to smaller spaces like a bedroom, bathroom, or kitchen, increasing their appeal for urban homeowners. 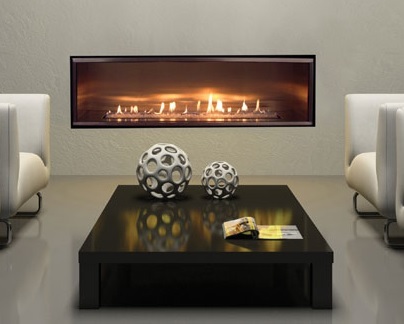 These contemporary gas fireplaces are not only beautiful, they are also heating powerhouses! With heat output reaching up to 55,000+ BTU/hr, you can quickly and easily zone heat your favorite room. Linear gas fireplaces are often found in two types of gas fuel; natural gas & liquid propane. Homeowners are able to choose which fuel type works best for them and can enjoy an efficient and versatile heat source that requires little maintenance and upkeep. Convenient features like adjustable flame height and heat output, electronic ignition, mood lighting, and even remote control, are just a few benefits of using a gas fireplace over a wood burning unit. A number of linear gas fireplaces even feature a valve system that is not dependent upon electricity which allows it to operate even during a power outage. European Home Fireplaces offers a variety of modern and contemporary gas fireplaces including direct vent, ventless, vent free, open front, linear, ribbon style, natural gas, NG and propane. Homeowners can enjoy clean lines and a crisp look which provide a contemporary feel to their fireplace designs. ORTAL Heating Solutions & Fireplaces is well known for offering a wide selection of modern gas linear fires, designed and constructed with close attention to detail, finishing, heating efficiency and quality. Boasting the largest selection of modern fireplaces, it’s no wonder why we love featuring their wonderful linear gas fireplaces in our collection. Lopi Fireplaces just introduced a brand new linear gas fireplace line that features a selection of high quality, beautifully-designed units. With GreenSmart™ 2 technology, ceramic glass for increase radiant heat, high heat output, accent mood lighting, high power twin blowers, decorative crush glass floor, an extra-large viewing area, and flexible venting options, these linear gas units are perfect for modern abodes. 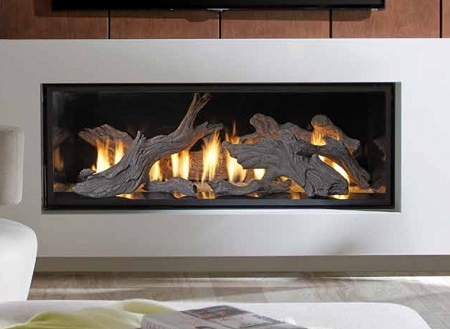 Fireplaceextrordinair has some of the most dramatic and beautiful linear gas fireplaces on the market. Their fireplaces feature unique and clean designs that complement a number of modern styles. Homeowners will love the extensive presentation of flames; limited edition interior fire-art; interior top-and-bottom lighting; three liner options; three glass floor media options; and built-to-suit exterior surround options. When it comes to choosing the interior design of your linear gas fireplace, try a contemporary alternative to log sets with a RealFyre product. From Diamond Nuggets to Fyre Glass, and even Geometric Shapes & Stones, RealFyre offers fantastic and beautiful modern alternatives to traditional gas log sets. Hearth Innovations offers a new concept in fireplaces. Their wall mount, direct vent linear gas fireplace is a great option for an efficient and beautiful heat sources. These gas units feature modern elements that will perfectly complement your contemporary styling and tastes. With a wide range of design and color options to choose from, you are sure to find exactly what you desire.